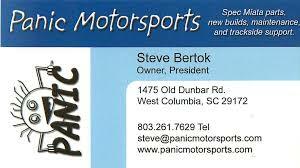 Steve Hampton of Chap Racing told me once “You know, I can remember a lot of races I ran and crewed. I can remember stories about what happened on the way to the track, during the race, in the pits, that night after the race and the trip home. I cannot remember where I placed or where my driver finished. Great memories about racing are as much about what happens peripheral to the race as it the race itself. ” He’s right! It’s the people, the things that broke, the tire that went flat, the tool you forgot, the part you broke, the awful food you ate, the uncomfortable hotel bed you slept in that had newlyweds next door, the creative solutions for getting ready for the next session, the conversations with stewards, courseworkers and other racers… all of it. Here is a great example. Not everyone can get involved in Time Trials, but those who’ve tried will tell you that they’re a lot of fun. Instead of 60 seconds, you get 15 minutes at a time. Did you like the course? You get to go around again, right away! Are you faster chasing someone (I am)? After the first session, they line you up by times, so the person in front of you is faster, and you get to chase them. 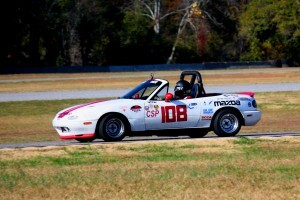 I had the distinct privilege of attending the “No Frills Time Trial” put on by the Tennessee Valley/Alabama Region SCCA November 5&6, 2011. I was invited there by Ted Theodore, to co-drive his car, Elvira, along with his son TJ and TJ’s friend Tyler Zellmer in a Time Trial. TJ was returning to lay down another class win, Tyler to get his TT license, and I was there along for the ride. The “No Frills” was run at Talladega Gran Prix Raceway in Munford, Alabama. It was part school, Time Trial, and Performance Driving Experience, or PDX. 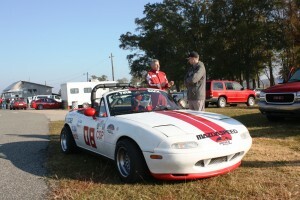 It was held under beautiful, if a bit chilly, weather down in central Alabama by a great group of folks from the SCCA. 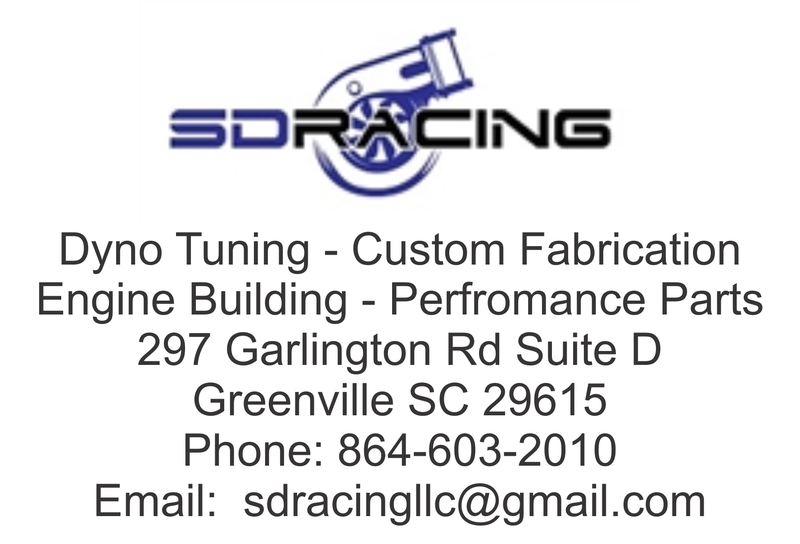 I was surprised that I knew quite a few of the drivers; besides Ted & TJ Theodore, Ron Wilcox was there with his beautiful, newly acquired Saab Sonnet race car and enclosed trailer; also, Joseph Armstrong and his RX-7 made the trip down from Raleigh, and Blair Underwood was there with his D Sports Racer. It was a great setting to do some driving. The course was designed for motorcycles, but the owner has enlarged it so that it is suitable for time trials as well. Google Earth only shows the old configuration, so on Trackmaster half your lap is in a corn field, but it’s a good course. 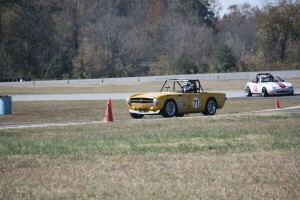 Lots of autocross type maneuvers, but at 50-90 plus MPH. It is a good course to learn on. 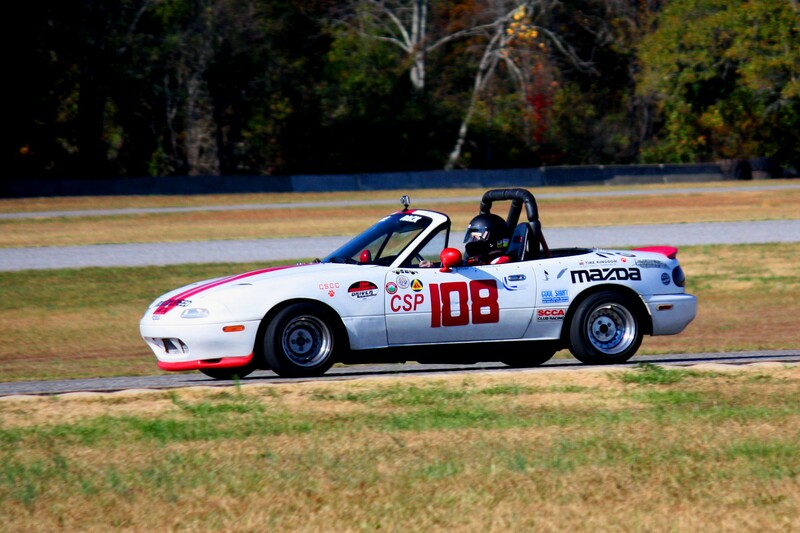 Elvira is a CSP Miata with a TT rollbar, six point harness, headers, intake, full suspension, and, most importantly, big, wide Hoosiers on 13 inch diameter wheels. With the gearing change from the tire size difference over stock, I was seeing 106 MPH at the end of most of the straights; Trackmaster said 92. The shorter tires multiply the already generous torque provided by all of Ted and TJ’s work meaning corner exits were a blast, and I got to see many a car getting smaller in the full-width NASCAR style mirror they had installed for the event. I went out first thing Saturday morning for my very first drive on a race course in Elvira. It was comforting, but also a bit unnerving, to need help to get in the fire suit, arm restraints, harness, and gloves to go out the first time. 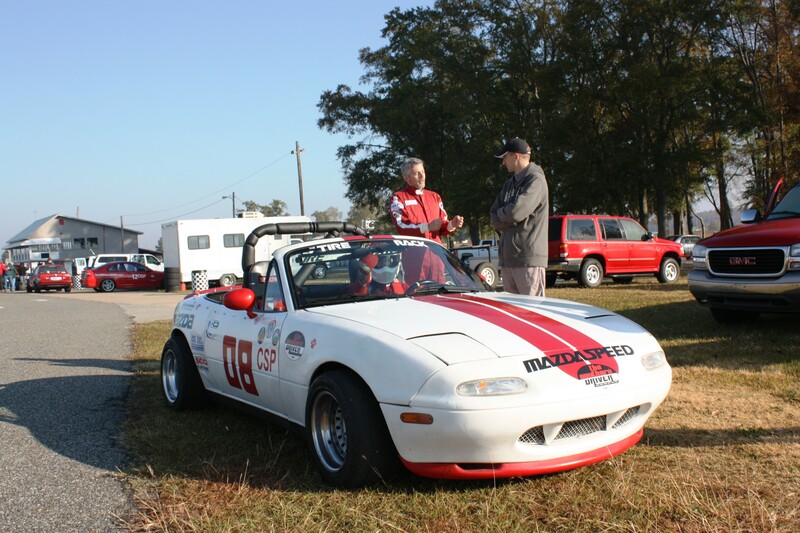 I had borrowed the suit, Nomex socks, gloves, underwear, and arm restraints from CCR SCCA’s Second Gear program; this program was started (by Ted, I believe) to provide those starting out with gear to do their first time trial without investing in hundreds of dollars of equipment. You ask for what you need, they loan it to you free of charge, and you return it in good condition. Very simple, and very generous of them. 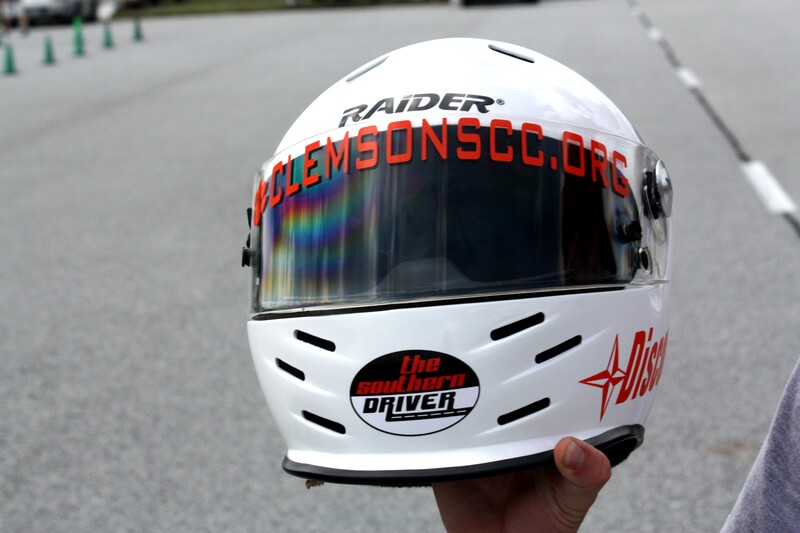 As I exited the pits, I put down the visor on Nariah Tracy’s helmet, which he was kind enough to lend me. I had seen frost on the ground and the tires before I left the paddock, so I knew to be cautious in warming up the tires. I was thankful that the Hoosiers were A6’s, which should warm quickly. What I didn’t count on was that the visor would immediately fog up. Here I am, going about 80, about to enter my first turn of my first time trial, and I can’t see anything and I don’t really remember how to get the visor up. I do remember that you don’t just grab and flip it, there is a release, and I can’t really remember which side it’s on nor can I feel very well through the gloves. Somehow, before braking to enter the turn, I manage to get it open, then I realize that the exit of this turn is right in the sun. And the sun is just coming up. I almost drive off the outside of the turn, because again I can’t see. Fortunately, everyone was going slowly as it was so cold. My heart rate then was about 140, and I hadn’t even started racing. The rest of the run was uneventful. Elvira is so neutral and has so much grip and grunt, if I made a mistake she covered it and I could power away from whoever caught me and get away from them. The rest of the day went well, with everyone going faster each run. Then, as you might imagine, we wore out some tires and broke things. First was, of all things, the shifter. With us two newbies driving, we somehow managed to unscrew the shift lever from the transmission. Tyler came in to the paddock, jiggling it quite ineffectively. Fortunately, a little Locktite and elbow grease, and he was back out. We replaced the tires as they showed the shiny bits, but, even cornering on air, Elvira never bit back. Then Tyler came in early on one run and said the engine didn’t sound right. Investigation revealed that the rear oxygen sensor had come adrift of its wire. There was no way to fix it, so we just had to let it run rich and backfire. This went well, until Tyler came in again making loud scraping noises. The header had broken and the front of the exhaust was dragging on the ground. Apparently there had been some strain or flex in the system that first broke the sensor wire, then broke the header. Ted is one to never say die. We loaded up Elvira on the trailer and set out to find us a welder. This is the adventure part of the story. With the help of GPS and two cell phones, we set about driving the 12 miles from Munford to destinations unknown (Lower Alabama). We found quite a few muffler shops, but none would answer their phone. We decided to drive by a few, thinking they were just too busy to answer. One after another, they were closed. It was the night of the first Alabama vs. LSU game and the state closed early. Ted got the idea to ask at an auto parts store. Have you ever stopped at a convenience store to ask directions and discovered that the person running the store only knows how to get to where he is, and he’s not sure about where he is? These guys were related to that guy. No dice. Finally I called a place and someone answered the phone. “Yelloh?” he said. “Is this a muffler shop” I said. “Yep” he said. I asked him if he could weld a header on a race car. “Nope, too thin” he said. I asked if he’d look at it, and he said he would. I put the name of the shop in the GPS, and off we went. Now, I need to tell you that here we are, two guys driving a truck towing a trailer through Alabama on a Saturday afternoon. 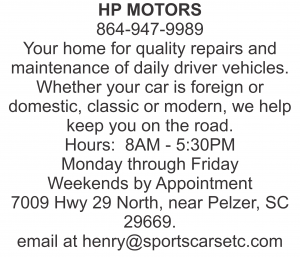 The car on the trailer could be a stock car, or a dragster, or even an old hot rod, no problem. 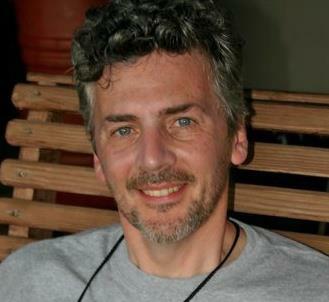 However, with my and Ted’s rugged good looks, and the fact that we’re towing a Miata with fangs, I’m a little leery of what the boys at the shop are going to think of us. Pretty boys from the city with a sissy car, or some such. I just hoped they didn’t want to hear us squeal like a pig. Images from Pulp Fiction flashed in my mind, but I forced them away and tried to share Ted’s optimism and he told me that, if you don’t give up, things always work out. We get to the shop and it’s plain that it’s closed up. Next door to it is, I kid you not, a Thrift Store for Jesus, according to the sign. We pull over and I ask Mrs. Jesus if she knows where the muffler shop guy is. She says he lives in the boarded-up house next to the Thrift shop, and I should knock on the door. I made darn sure I wasn’t standing straight in front of that door when I knocked. I was afraid of being ventilated by a shotgun. I also gave a timid little limp-wristed knock at first, afraid of waking up somebody mean. I decided, given the situation, I had better switch to a manly knock pretty quick. That still didn’t work. So I went back (quickly) to talk to the lady. Now, for all his optimism, during this little brush with death, Ted is sitting in the truck. Those of you who remember Mutual of Omaha will remember Jim wrestling the alligator; Ted was playing Marlon Perkins to the hilt. The lady dials her phone with some long, red, apparently very religious nails while holding a cigarette and talks to someone. She asks where he is and tells him he’s got customers. As she’s talking, a tall, stern, menacing man appears from behind her and limps softly up on her with a stern look on his face. He is wearing blue coveralls and has a bandana on his head, and looks like Hell’s Angels meets Meineke Muffler. I retreat safely behind her. Only when he’s an arm’s length away does he tell her he’s right behind her. Creepy. He looks at Elvira and what’s left of her exhaust on the trailer, mumbles, and allows as how he can’t fix her on the trailer, so we back her off and Ted and the man disappear into the shop. I am going to have to use the road to get from where we parked to the shop, and I can’t remember whether Elvira has a tag. I drive very quickly (and loudly) to the bay door and onto the lift. Ted continues in his optimistic vein, but the guy still looks disgusted and put out. Turns out he isn’t open on Saturdays and was sitting home in his underwear ready to watch the game when I called. Then Ted mentions cash, and the fellow transforms. He becomes right personable even. Ted inquires about his limp and recons he’s either been in service or has a motorcycle. Turns out he has a gorgeous bike in the garage, and… a Miata! The first one I’ve ever seen with half moon chrome hubcaps, but a Miata nonetheless. Then he gets to work. He does a great job on the repair, tells us some great stories, and is all smiles when he’s paid (apparently enough to make it worth his while to get dressed). Ted’s optimism vindicated, we trailer her and head back for another day of driving without incident. Other than the four other corded tires. It was a great weekend of racing, and we didn’t get raped or killed. What more could you want? Cliff’s Notes: Time Trials are cool, thanks Ted. I didn’t get beat up at the exhaust shop, had a great time and all is well. I’ll be back.